The 46th District Democrats Meeting will be Wednesday, September 26th, at 7:00pm, at the Seattle Mennonite Church Auditorium, located at 3120 NE 125th St, in Lake City. 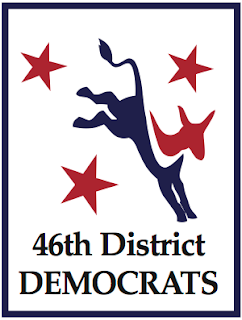 It will include an expert panel from the state and national Democratic rules committees, for a discussion of Primaries and Caucuses, where we in Washington have been and where we are headed, with a special conversation about new gender parity and diversity rules. The panel includes State Rep. Javier Valdez who will discuss the legislature's role, DNC member and long-serving national rules committee member David McDonald with DNC member Sharon Mast who will discuss the history of caucuses, primaries, and current developments with the DNC, and WSDCC state rules committee chairs Sophia Danenberg and Chris Roberts who will talk about the state rules and changes that would have to happen.